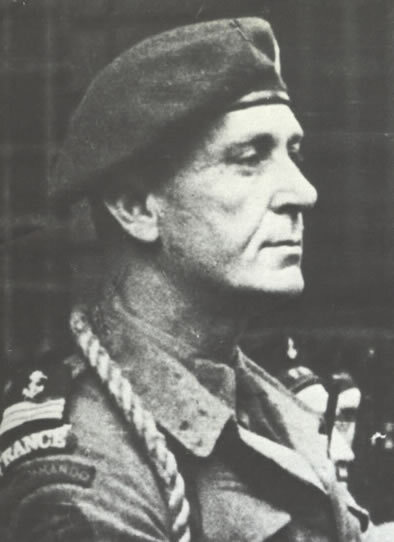 Philippe Kieffer, one of the first French to join Free France, was entrusted with 16 volunteers in April 1942, who then trained at Camp Camberley in Great Britain with Lieutenant Jean Pinelli. 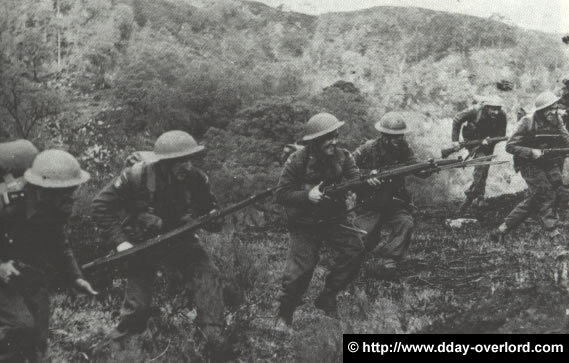 At the beginning of May 1942, the small troop (23 men) is patented at Camp Achnacarry (Scotland) and officially receives the title of “1st Company, Marine Commando”. While these men train at the Eastney depot, they are reinforced later by Lieutenant Charles Trepel, appointed Commander-in-Chief of Commander Kieffer. 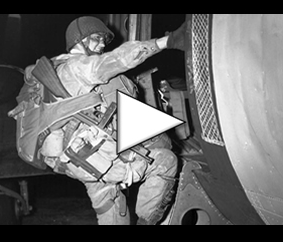 Commando training is extremely difficult, the events are selective: men must maneuver in all weathers, on all types of obstacles: marches, live ammunition training, close combat, etc. On July 14, 1942, National Holiday in France, the small company composed of thirty units parade through the streets of London on the occasion of the French National Day. On 10 August, the 1st Company is attached to No. 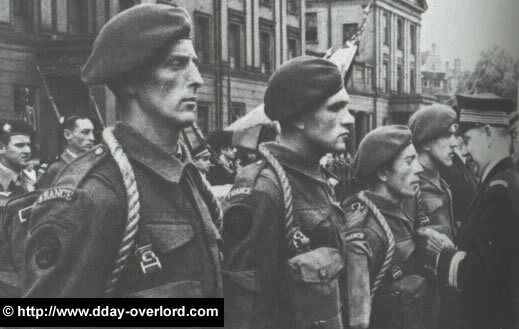 10 Commando Inter Allied, based in Wales, where it can be found troops of all origins (Belgium, Holland, Norway, Poland, Czechoslovakia, but also anti-Nazis from Germany and Austria). On May 31, 1943, No. 10 Commando took up its new quarters in Eastbourne, Sussex. The 1st company (or “Troop 1”) then has 81 men. 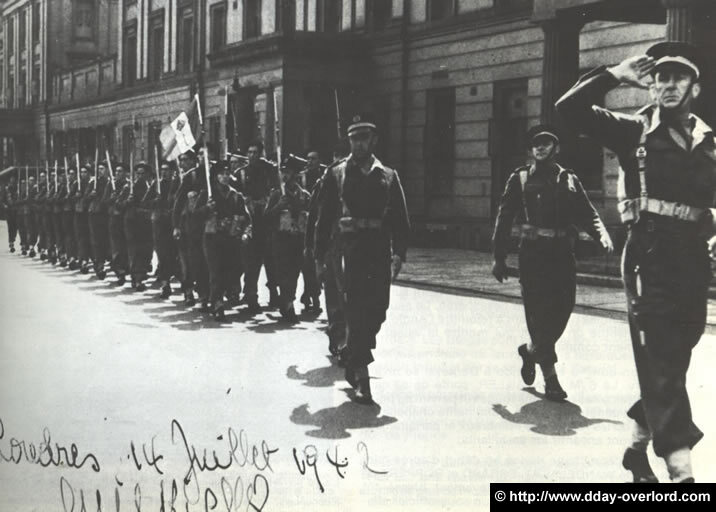 15 French soldiers take part in the coup on Dieppe on August 19, 1942. The 1st company, divided into three groups that go to reinforce other commandos and the Canadian soldiers, refused the wearing of the helmets in favor of caps and baches with red pompoms of the French Navy. The men also kept the strips “France” sewn on the uniform. Lieutenant Guy Vourc’h lands in front of Dieppe Casino in the center of the attack area. The other two commando groups attack the coastal artillery batteries, including the Varengeville Battery, where the Rabouhans and Taverne soldiers, attached to Lord Lovat’s Commando No. 4, do an extraordinary job of protecting the retreat’s progress. which proved to be crucial in the rest of the operation. But at the beginning of the afternoon, the situation being catastrophic, the French commandos are ordered to pick up and join the ships. Montailler, one of these soldiers, died on the ground as a result of serious injuries. Caesar, taken prisoner, manages to escape and to join England after a passage in Spain. 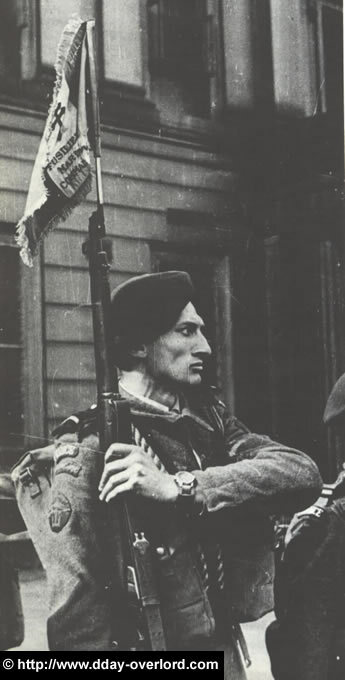 The existence of the French commando is then made official following the raid on Dieppe. 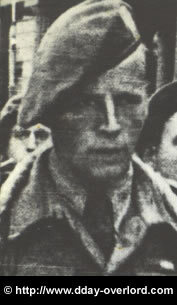 In May 1943, while Troop 1 was formed, Lieutenant Charles Trepel organized the creation of a second troop of French volunteers. It is formed by soldiers escaped from France and others from North Africa or Lebanon. They are 75 to pass the entrance tests which end on May 28, 1943. The next day, they reach the camp of Achnacarry in Scotland where their training intensifies to perfect the cohesion of the group. Lieutenant Hulot, just out of the Cadet School, also coaches the company that takes the title of commando and Troop 8. 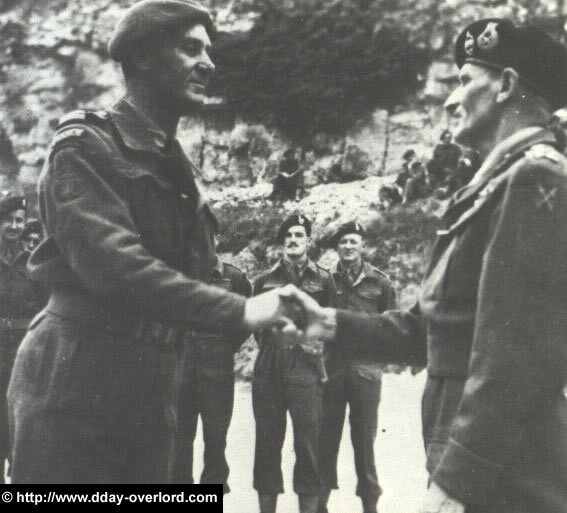 It was in October 1943 that the two troops 1 and 8 met in Eastbourne (Sussex) while the No. 10 Commando Inter Allied was removed. The training continues while the commandos are employed in different raids. 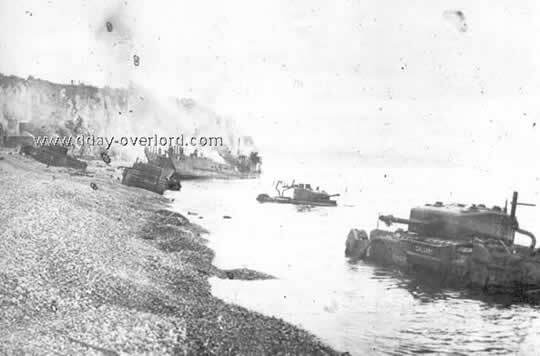 These raids are intended to recognize the establishment of enemy defenses: commandos of less than 10 men land in utter silence on enemy shores. There were a total of 10 raids conducted by 80 French commandos from July 1942 to February 1944, from small motorboats (7 HP Austin), and while most of them went off without a hitch, many soldiers paid with their lives these dangerous missions (Captain Ayton, Maître Wallerand, Bellamy, Dignac…). 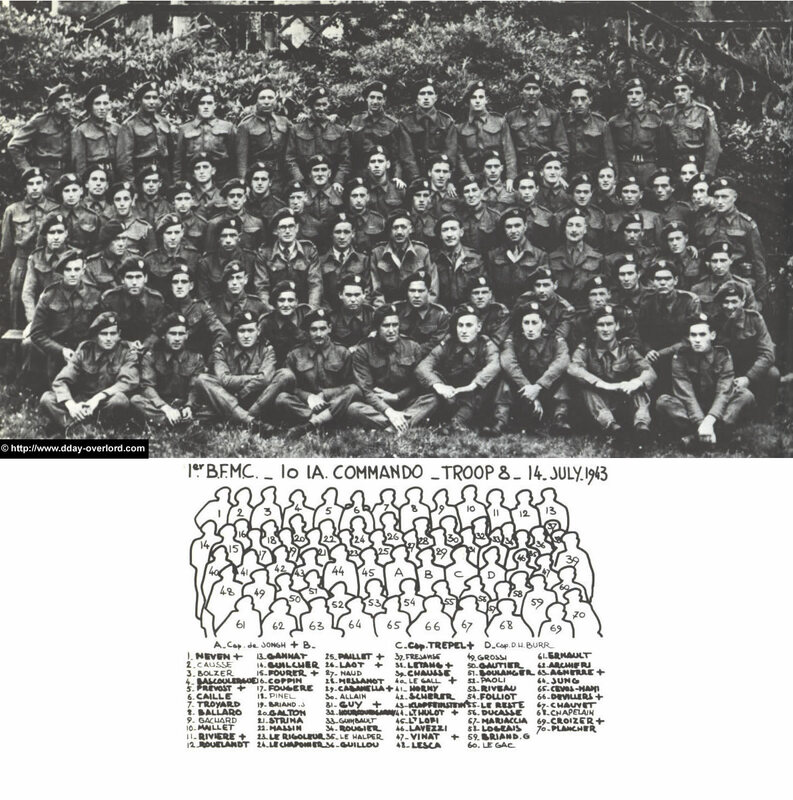 Volunteers and elements of Troop 8 were assembled in November 1943 under Lieutenant Amaury’s orders to form a new combat section. Portsmouth begins the difficult training leading to the famous commando title. Troop 9 specializes in support training in machine guns with a high rate of fire. She receives new personnel who will mark this unit: Lieutenant Hubert (Deputy to Lieutenant Amaury), Captain Lion, Head of Health Section (the nurses and medical equipment are then attached to the Troop 9), Chaplain René de Naurois. 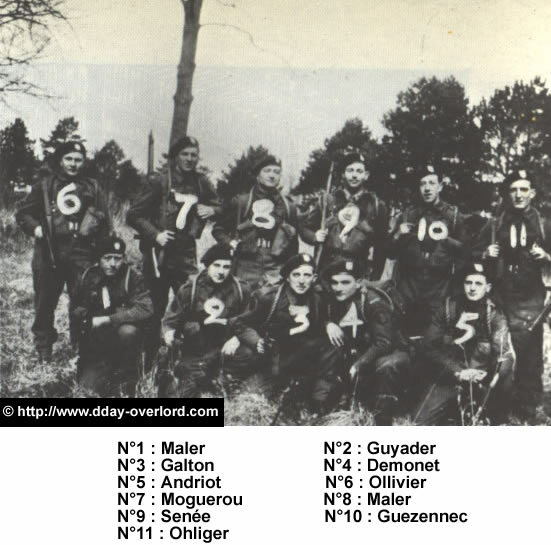 In March 1944, all French commandos officially received the title of 1st Battalion Fusiliers Marins Commandos. At the end of the month, the 1st FMRB goes to Scotland (near Nairn) for a series of major maneuvers that last 5 days and see the deployment of the 3rd British Infantry Division, Royal Navy units and numerous elements of the Royal Air Force. At the end of the exercise, the 1st FMRB is attached to the Special Service Brigade (Commando No. 4) of Lord Lovat. Throughout the month of April, training intensifies in Sussex (Bexhille-on-Sea). 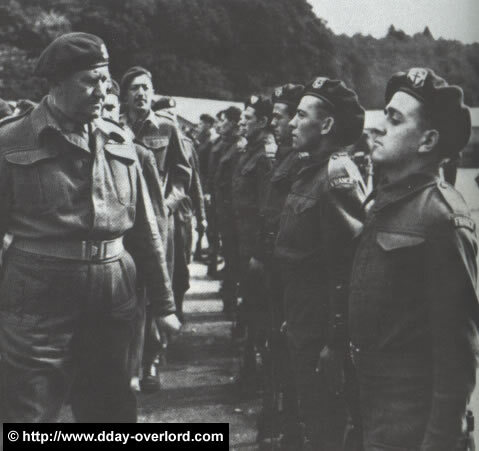 In May 1944, the 1st FMRB is reviewed by Admiral Dargenlieu who gives him his badges of unity while the “French Commando” passes under the orders of Lord Lovat. On May 25, the 1st BFMC is isolated at the base of Titchefield, where the soldiers can not communicate with the outside. 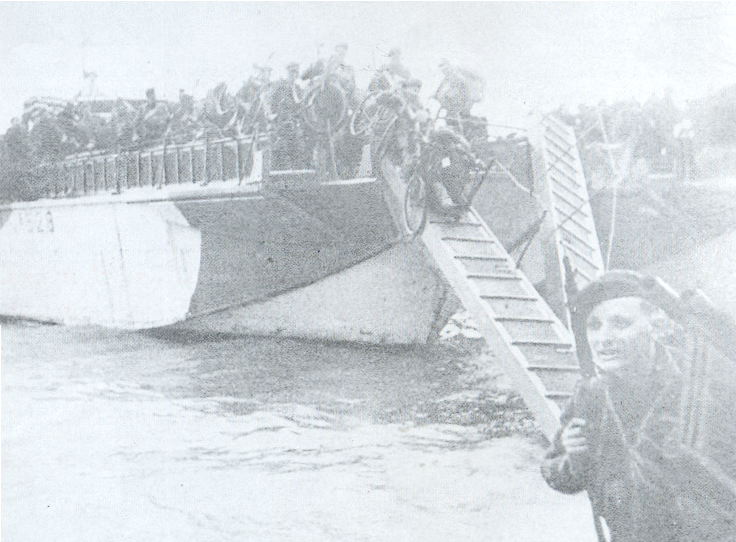 Between the 2nd and the 5th of June, the French commandos, with the commando No.4, embark on the transport ships. At 5 pm on June 5, 1944, the French commandos embarked on two LCI (Landing Craft Infantry): the LCI 527 for the Troop 1, the LCI 528 for the Troop 8. The French commandos (177 units) learned on June 5 to 22 o’clock the destination of the invading fleet: Normandy. Specifically, they must land near the town of Hermanville-sur-Mer, opposite the place called La Breche (Sword Beach). 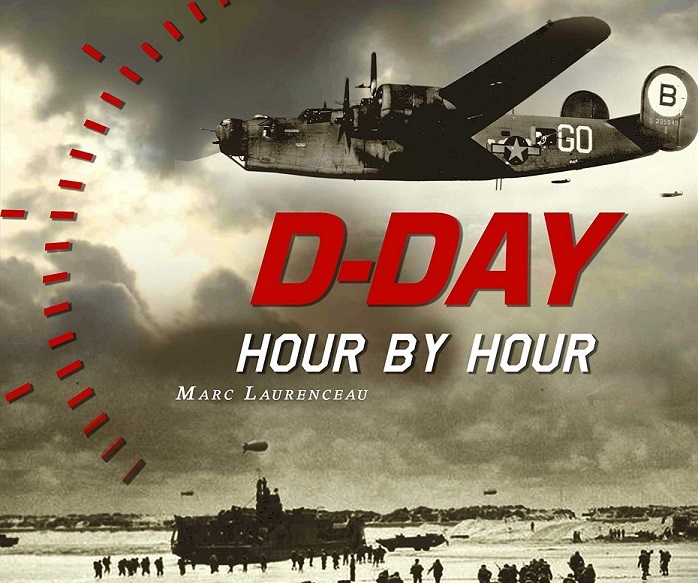 At 7:31 am, Tuesday, June 6, 1944, the French soldiers are put to the ground. 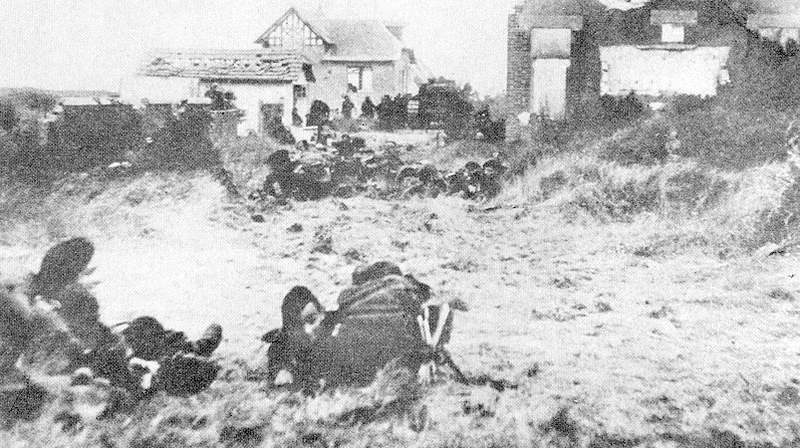 They immediately attack Ouistreham, accompanied by British soldiers of the 1st Special Service Brigade, Commando No. 4. Shortly after noon, they join the paratroopers of the 6th Airborne at Pegasus Bridge, commanded by Major Howard. At the end of the day, the hard-pressed French commandos reach their goal of Amfreville-le-Plein. The command post moved to Le Hauger. On the evening of June 6, 1944, the 1st BFMC had 8 dead (including Captain Lion, Lieutenant Hubert and Sergeant Dumanoir) and 31 wounded unable to fight. The French resist the line Amfreville-La Hauger from June 6 to July 26, including repelling a tank attack on June 10. They then settle in the western half of the Bois de Bavent, which will only be taken on August 17th. From August 18th to 19th, the 1st Special Service Brigade crosses the flooded areas in the region of Dives to Robebonne. The French engaged in furious fighting in the locality of Epine where they made many prisoners, before releasing Pont-L’Evêque on August 24th. The 1st FMRB delivers its last battles on the night of August 24 to 25 south-east of the forest of Saint-Gratien. At the end of the Battle of Normandy, only 40 out of 177 men left on the field during these 83 days of combat. 32 wounded returned to the front line after rapid care. The 1st Battalion Fusiliers Marins Commandos embarked on September 7, 1944 in Arromanches to join the Petworth camp. On the 10th of September, when the Battle of Normandy is over, the soldiers enjoy the first departure on leave after D-Day.